Adopt a vine in France. Personalised wine experience gifts for wine lovers. Looking for an original wine gift for a wine lover? Adopt a vine in France, visit your French vineyard and receive a wine experience gift box, newsletters and your own personalised bottles of French organic wine. Original wine gift idea for all wine lovers. 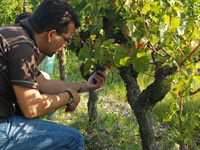 Adopt a vine in France and make your own wine! The Gourmet Odyssey Wine Experience is designed to go beyond the traditional wine tasting and vineyard tours. Whether you choose to include one or more wine experience days, or whether you wish to follow the making of your wine virtually, you’ll get behind the scenes to discover what it’s really like to be a winemaker . What’s Included in the Wine Experience? 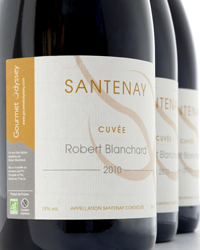 The choice of one of the partner vineyards in France carefully chosen by Gourmet Odyssey. Adopt a vine in your chosen vineyard for a wine making year. Choose the number of vines that you wish to include in your adopt-a-vine pack (6-36 vines. 1 vine = 1 bottle of wine). Welcome gift pack containing a wine cooler bag, DropStop, re-usable glass wine bottle top, personalised certificate and details of the wine experience selected. Choice of up to 3 wine experience days at your vineyard to learn and participate in the different stages of wine making, meet the owner, taste the wines and share a typical winemakers meal. Each visit lasts the whole day , the time necessary to exchange with the winemaker, to participate in and discover his work. Each day is also valid for 2 people , so bring a guest! 5% discount included for 2 or more experience days ordered ! 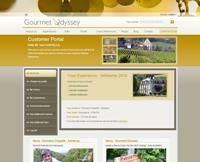 You can also choose the virtual option if you do not wish to include any wine experience days. Newsletters and customer portal to follow the evolution of your vintage remotely. Personalised bottles of wine (6-36 bottles) that your adopted vines have helped to make. One bottle of personalised wine for each adopted vine. Watch this short 2 minute video to give you a glimpse of what the Gourmet Odyssey Wine Experience is all about. Choose to adopt a vine and follow the making of your wine at one of the following organic vineyards in the heart of the main wine making regions of France. A biodynamic winery making delightful wines that express their unique Côtes du Rhône terroir. Organic vineyard in the south of the Côte de Beaune producing top quality Burgundy wines. How are our Partner Vineyards chosen? Quality wine. The wines from all of the partners have won numerous awards and accolades from the wine industry. Authentic independent producers. Each Gourmet Odyssey partner controls all stages of wine making from growing the vines, harvesting the grapes, vinifying and bottling the wine, through to its commercialisation. 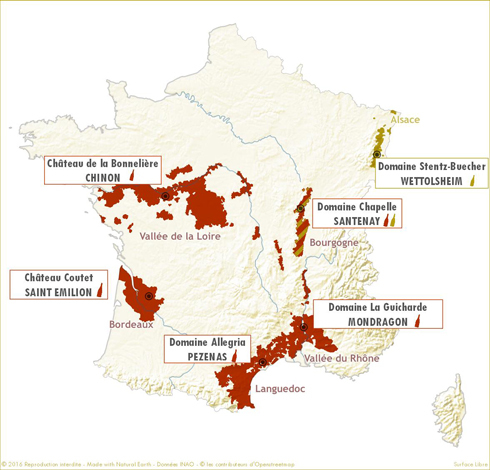 Most partners are members of the well known Vigneron Indépendant association that has become the symbol for authentic, individually expressive wines in France. Organic certification. Each Winemaker uses methods, treatments and processes that respect the surrounding environment and natural composition of their wine. All of our partner vineyards have been awarded official French organic wine producer status, and some also have biodynamic certification. Generous and warm hospitality. Each vineyard partner relishes welcoming you to their winery, and takes pride in sharing their passion and knowledge of their wine making profession. Charm and character of winery and region. Each of the venues has also been chosen for being a place where you will be happy to spend your time and explore. There is plenty to see and do in each of the selected areas of France when visiting on a Gourmet Odyssey Wine Experience day. For the duration of the wine making year, you will adopt your choice of between 6 and 36 vines. You will be informed of the exact location of your vines in the vineyard so that you can visit them during a Gourmet Odyssey Wine Experience Day. You receive a personalised bottle of wine at the end of your wine experience for each vine you adopt. Follow the progress and journey of your grapes as they bud and flourish until being harvested, where they are taken to the winery, carefully sorted, and placed into the vats to begin the fermentation and vinification process. Please note that your adopted vines remain the property of the winery at all times, so unfortunately you can’t dig them up and take them with you! You can choose whether to have the pack sent to you, or delivered directly to someone else if being offered as a present. Gift-wrapping and personalised message options are also available. more details on delivery options. You can choose between the Wine Discovery Experience Day , the Harvest Experience Day , and the Vinification Experience Day . 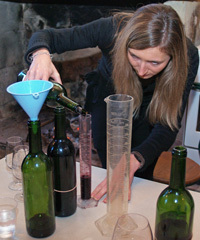 These wine making experience days get you involved in helping to make your wine. You'll spend a whole day from 9:30 to 16:00 at your winery where you'll also get to visit your vines, and meet the winemakers who will share with you their passion and know-how. You will savour a typical winemaker’s meal, and of course there will be a wine tasting session at each visit to sample a previous vintage of the wine chosen for your cuvée, and other wines produced by the winery. The Wine Experience Days are also a great excuse to get away and explore some of France’s most charming regions. Each customer is allowed to bring along a guest on each of the experience days. If the idea of spending a day in a vineyard and getting their hands dirty isn’t your traveling partner’s idea of fun, then there are plenty of other ways for them to spend a great day in each of the locations (go to the "Practical Information" Section on each of the winery description pages: Alsace , Bordeaux , Burgundy , Languedoc , Loire Valley , Rhône Valley ). Each region of France has a host of gourmet and cultural treasures to discover. During your visit for one of the Gourmet Odyssey Experience Days, you could explore the Alsace wine route and savour the local culinary delights. In Bordeaux , visit some of the many wine châteaux and the Cité du Vin. In the southern French region of Languedoc-Roussillon , wander around the medieval villages and discover the talents of the region’s young winemakers. In Burgundy , visit the abbeys that are intertwined with the region’s wine heritage, and try out different food and wine pairings with the high quality of the local gastronomy. The Loire Valley offers the spectacular châteaux that housed France’s royalty, and breathtaking scenery of the vineyards and rivers. In the Rhone Valley , soak up the sun, and treat your taste buds to an explosion of sensations with the variety of fresh food. Turn your Gourmet Odyssey Wine Experience into a week-end or short break, and make the most of your visit to your chosen wine-growing region. Please note that travel and accommodation are not included in the Gourmet Odyssey Wine Experience package, leaving you the freedom to stay where and for however long you like. Gourmet Odyssey will however provide you with a list of recommended hotels, B&Bs and useful contact details to help you in your choice (go to the "Practical Information" Section on each of the winery description pages: Alsace , Bordeaux , Burgundy , Languedoc , Loire Valley , Rhône Valley ). 5% discount included for 2 or more experience days ordered ! Choice of dates typically available during the weekend from February to July. 9:30 to 16:00. Participate in some of the activities that need doing such as pruning, treating the vines, leaf removal, or working in the cellar. This isn’t just a normal vineyard tour remember! Choice of dates typically available during the weekend in September or October depending on the winery. 9:30 to 16:00. After all that effort, you’ll welcome the “repas des vendengeurs” (harvesters meal), and glass of wine! Choice of dates typically available during the weekend from February to April. 9:30 to 16:00. The purpose of this wine experience day is to learn what happens to the wine as it matures between fermentation and being ready for bottling. This is where the skills of the oenologue really come into play as they analyse the wine held in different barrels and vats. Receive a wine tasting lesson to help develop your senses of sight, smell and taste. Each vineyard has different date options available for the wine experience days according to the customs and climate of the region. To give you an idea of the timing, please look at the typical timeline . A selection of exact dates will be published in the Recipient Customer Portal, enabling you to choose the date that best suits you. Most of the wine experience days take place during weekends. Should you not be available for any of the dates , not to worry. Just contact us, and we'll do our best to find a solution, either by carrying your day over to the following year, or exchanging it for a day at one of our other partner wineries. Our objective is that all of our clients benefit fully from their Wine Experience . 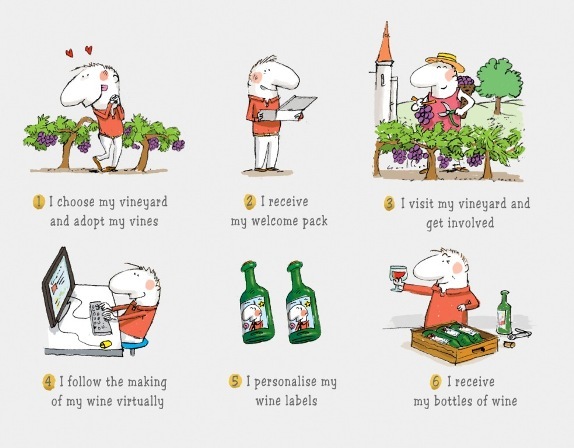 Don't Wish to Participate in Any of the Wine Experience Days? That’s no problem – just check the “No Experience Days” option when ordering. You will still have the opportunity to follow the evolution of your vintage virtually through the newsletters and private customer portal. Should you, or the person to whom you are giving the Wine Experience gift, wish to add one or more experience days at a later date, that's possible too - just contact us . You can follow the progress of your vines and the making of your wine virtually through newsletters and your private customer portal. Gourmet Odyssey will provide regular news, updates and photos from your winery, so even if you are physically far away, your Gourmet Odyssey Wine Experience is always close to you. Once the wine is ready for bottling, your personalised labels will be applied and you will be notified that your wine is available. You can choose to collect the wine directly from the winery, or pay for the wine to be delivered to you. Please see the Delivery Options section for more information.